(Lancaster, Pa., July 13, 2017) - The San Francisco Giants have purchased the contract of Barnstormers outfielder Caleb Gindl, it was announced today. He is the fourth Barnstormers player this season to go to the Giants organization, all within a span of two and one-half weeks. RHP Cody Hall, LHP Nate Reed and 1B K.C. Hobson all headed to Class AA Richmond during the week of June 26. 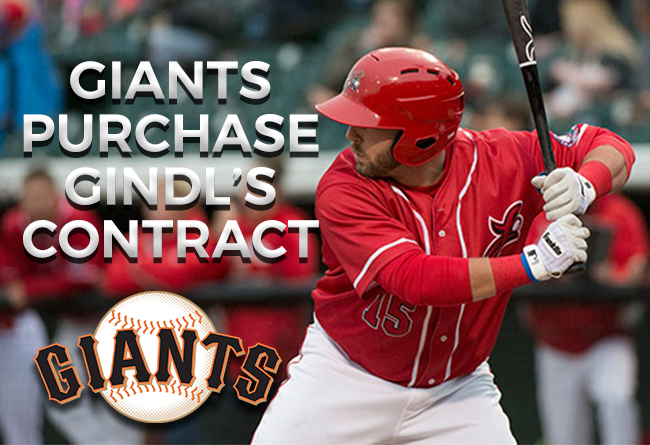 Gindl, 28, was batting .281 with nine home runs and 47 RBI in 71 games played this season. The native of the Pensacola, FL area also contributed 15 doubles and two triples. He had slugged four homers, including a game winner at Long Island, and driven home 10 runs in the last eight games prior to the Atlantic League All-Star break. The left-handed hitter was spending his second year with Lancaster. He batted .295 with 10 home runs and 72 RBI for the Barnstormers in 2016 and was named to the Atlantic League’s year-end All-Star Team. He was also the MVP of the 2016 Atlantic League All-Star Game, held in Lancaster. Following the season, Gindl was signed by the Chicago White Sox. He was released by Chicago near the end of spring training. Gindl has prior Major League experience with the Milwaukee Brewers. He batted .242 with five home runs and 14 RBI for Milwaukee in 2013, hitting a walkoff home run against the Miami Marlins.